In the beach town of Heaven, though, everything changes. For the first time, Dani starts to feel at home. She’s making friends and has even met a guy. But these people can never know the real Dani–because of who she is. When it turns out that her new friend lives in the house they’ve targeted for their next job and the cute guy is a cop, Dani must question where her loyalties lie: with the life she’s always known–or the one she’s always wanted. I am not exactly an Elizabeth Scott fan. I bought two of her books on an impulse sometime last year (Bloom and Perfect You) and I didn’t like them. Since then, I wasn’t really keen on reading another Elizabeth Scott book, fearing that it might just end up like the ones I read. I don’t know what made me give her another chance in this book — maybe it was the cover, maybe I was just bored so I picked this up. If I was disappointed with the first two Elizabeth Scott books I read, Stealing Heaven changes all those first and second impressions. The premise alone was interesting: here was Danielle, who has been stealing things since she could remember, and she felt that it would be what she’d be doing all the rest of her life. She’s never had a real ID in her life and she has a lot of fake names for as long as she could remember. Danielle has no friends, knows more about houses and security systems and getting information, even if she didn’t go to school. She’s loyal to her mom and she loves her, even if she seems to be the adult one in the family. However, when Danielle and her mom get to a small town named Heaven, things change for her. Stealing Heaven was way different from Bloom and Perfect You . Somehow I felt it was more serious, and the story flow was smoother and somehow easier to read. It reminded me a lot of a Dessen book, which is probably one of the reasons why I liked it so much. There were strong characters all over — characters I can’t help but like. One such character is Greg, the cop who befriends Danielle and cared more about her than his being a cop. I thought Greg was a very nice contrast to Danielle — Danielle is a crook, to put it simply, while Greg is the one who puts crooks to jail. He had a very interesting back story, and he felt genuine enough for me to believe that he did care for the protagonist. He was witty, and he didn’t give up on being nice to Danielle even if she was always putting him off. In a way, Greg reminded me of Dexter from This Lullaby by Sarah Dessen, but less of a goof (and that reminds me — I want to re-read that book). My mother taught me to believe in silver, to believe in things, but I think it’s more important to believe in me. 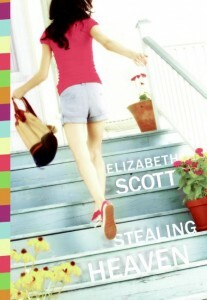 → The first Elizabeth Scott book that I liked! If you would read Scott, this is a good place to start. Pingback: One More Page » Blog Archive » Waiting on Wednesday: Grace by Elizabeth Scott - Because I can't stop reading them, it's just right to write about them, don't you think? Pingback: One More Page » Blog Archive » Teaser Tuesday: Take Me There by Susane Colasanti - Because I can't stop reading them, it's just right to write about them, don't you think?